I purposely took the photo above with a flash so you could see how glittery they are. 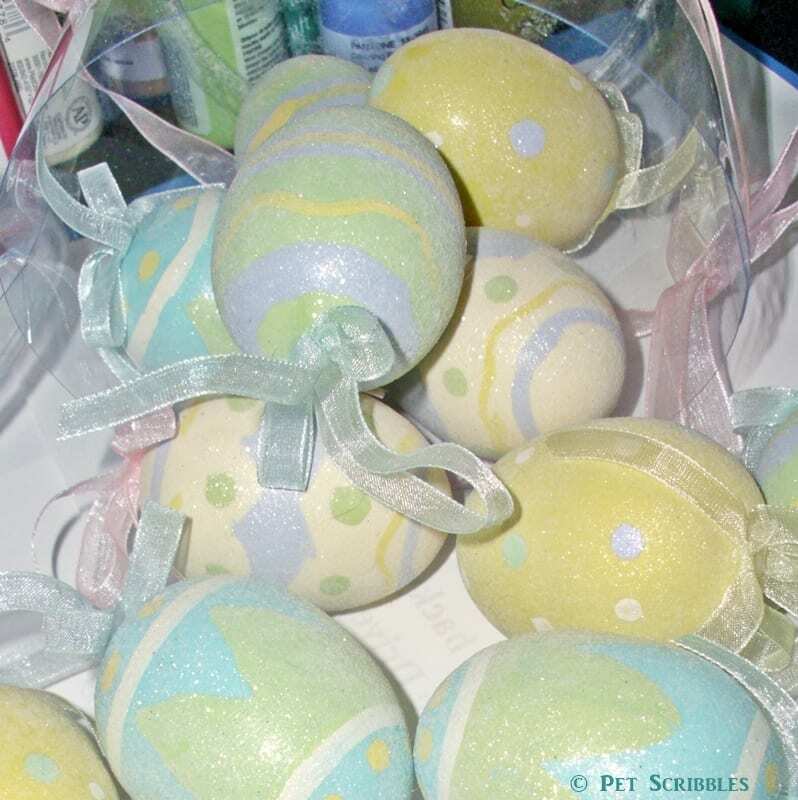 The glitter is a type that easily comes off on your fingers or anything else the eggs touch, making these eggs not the most pet friendly. Plus the pastels just weren’t doing it for me. Or my husband. Last year I made the best of them, and put them into this gorgeous antique copper vase that was handmade in Germany by my husband’s great uncle. But this year, I decided I had to paint over them to get the look I wanted. 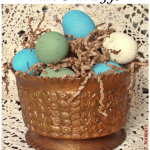 There are a zillion egg decorating tutorials out there on the interwebs. 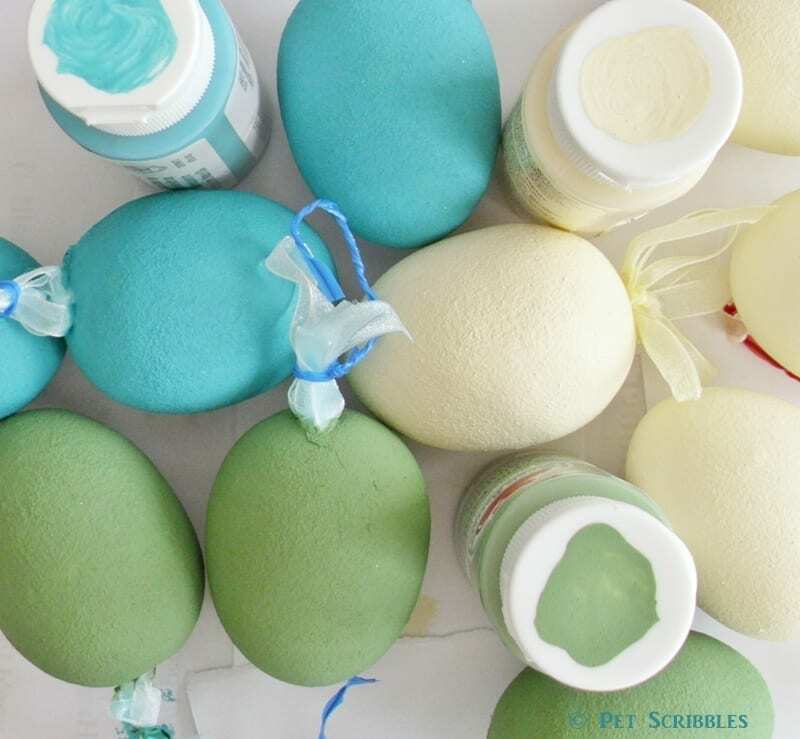 Yes, I’ve counted them, and I’ve pinned many of them onto my DIY Easter Eggs Board on Pinterest. 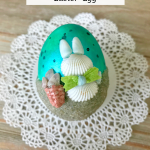 And last year I shared some of my egg DIY favorites with you in my Egg Decorating post. 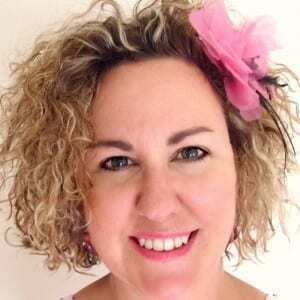 But I have a favorite tutorial by my friend Vivienne, who blogs over at The V Spot. 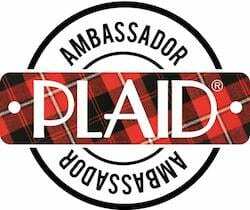 Hers is so popular that Plaid Crafts asked her to demonstrate it at the recent Craft and Hobby Association Winter Trade Show in January. 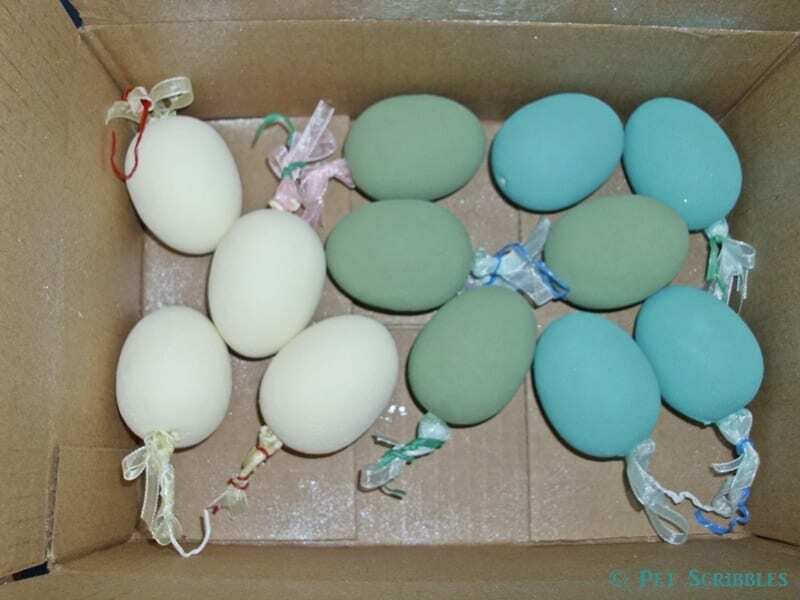 Here’s a link to Vivienne’s video tutorial, which I followed to give my pastel eggs a makeover. Helpful tip for craft paints: Paint the top of each craft paint bottle so you can better “see” what each color looks like. Makes finding the paint you want a tiny bit quicker. Another egg inspiration (does that even make grammatical sense?) is my friend Carolyn who blogs at Homework. 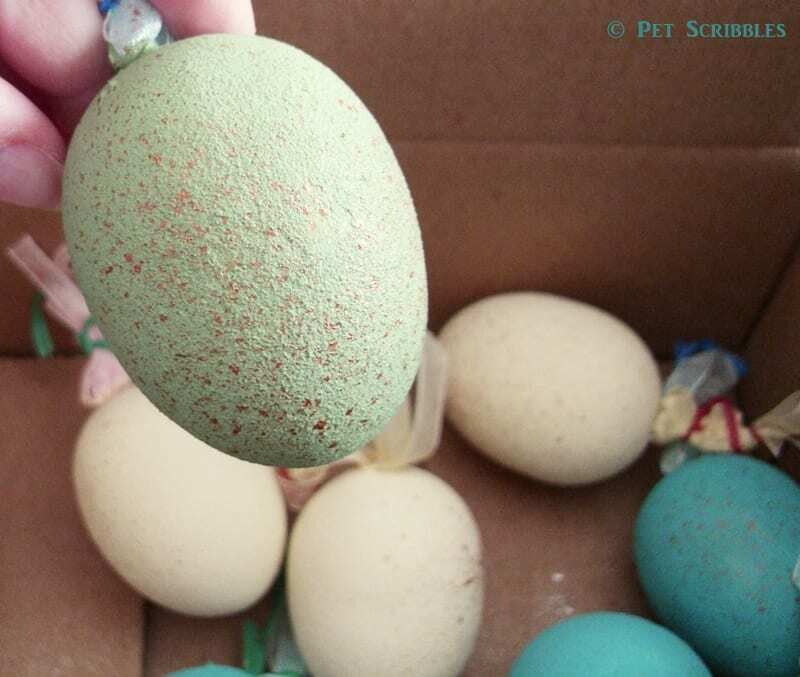 She did a slight variation on the egg design by using a metallic gold for the “specks” on her eggs. 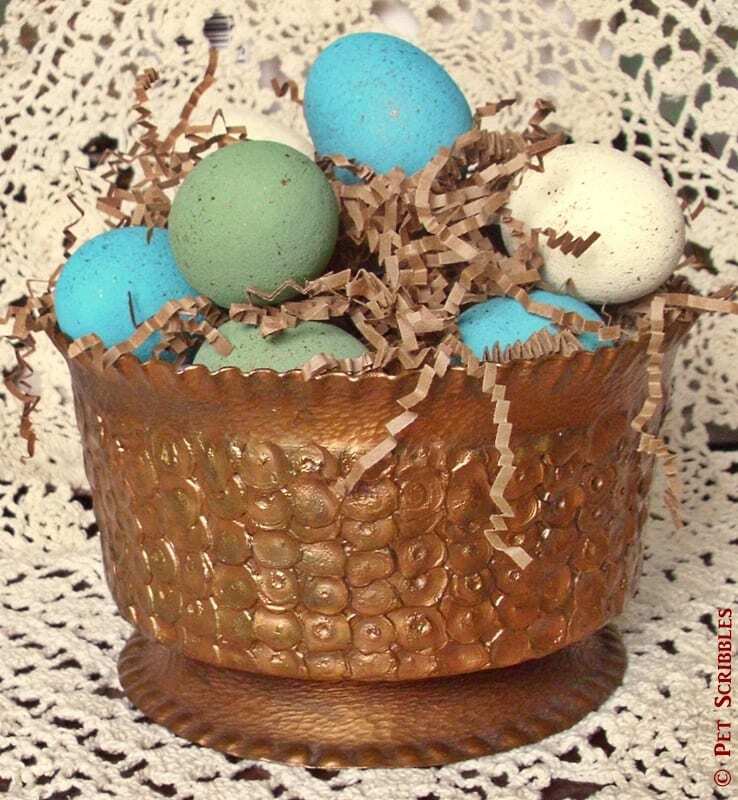 I love how that looks, so I did my specks in a metallic copper shade, which I knew would also match the antique vase I planned on using. 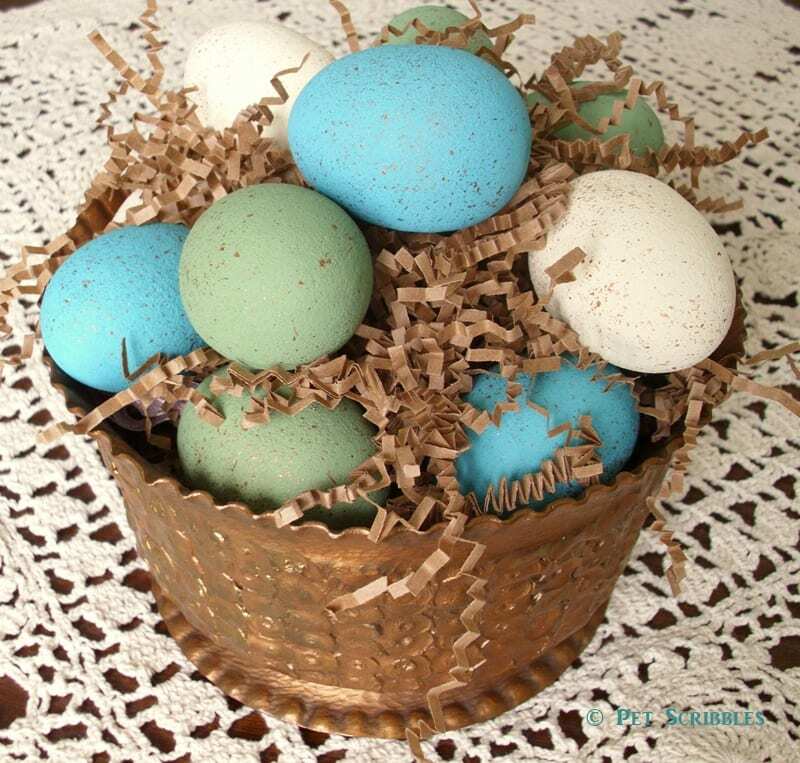 First I placed my eggs inside of a small box, to protect my surroundings from paint splatter. Then, as Vivienne demonstrates in her video, simply take a toothbrush, dip it into your paint, and flick it onto your eggs by running your fingers along the brush’s bristles. Once the eggs are dry, simply flip them over and do the same technique on the other sections of the eggs. 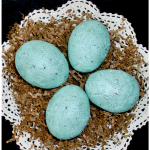 As Vivienne points out in her video, the specks will be random, some heavy and some light, just like shells of real bird eggs. What a difference some paint can make! These eggs not only match the antique vase better, but they match our decor and our home perfectly. Just in time for Spring! 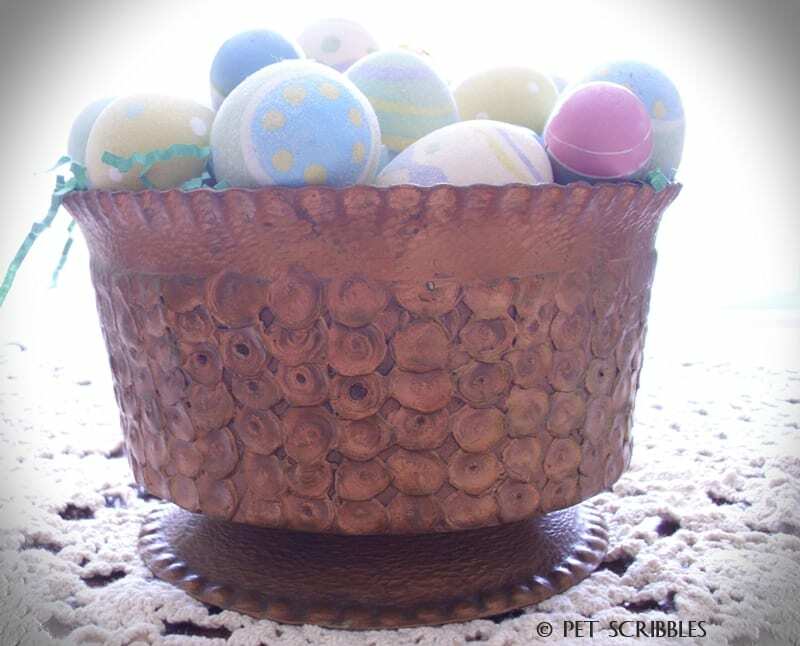 Do you decorate with eggs? 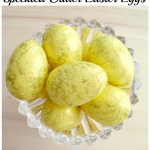 Do you use eggs just for Easter or do you keep them out for Spring? 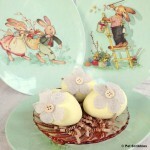 My Elegant Faux Springtime Eggs are on Parade Magazine’s website! They look great! It is a great transformation isn’t it? These look great! I am so happy that my project inspired you! That makes my whole month! Thank you! Thanks so much Viv! And I made your whole month? Now THAT is influence. Ha!! 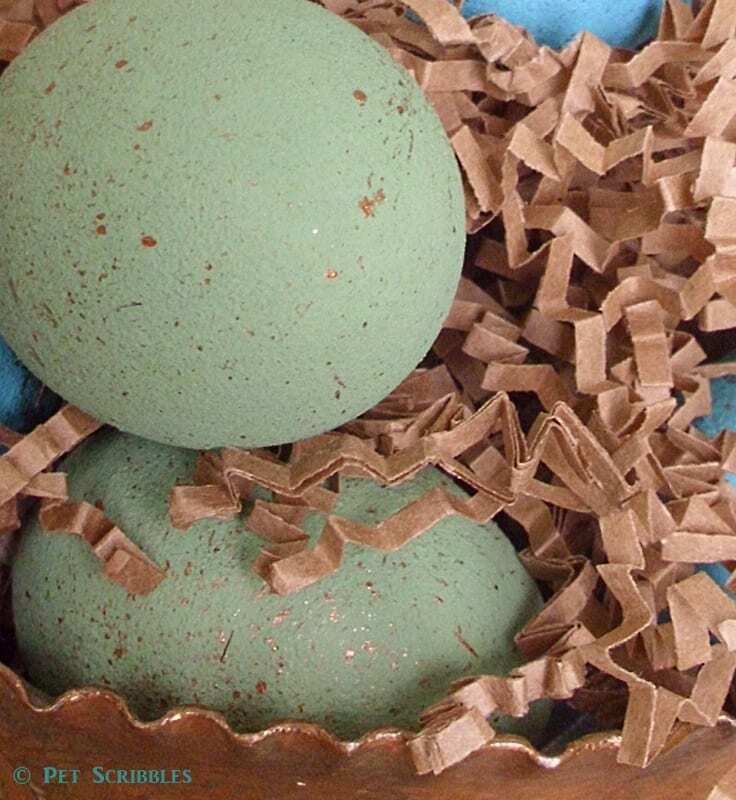 i love a speckled egg…especially the copper ones 😉 These look good enough to eat…but I won’t try it I promise. What a lovely addition to your spring decor! 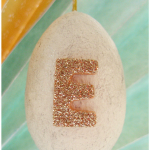 I recently un-glittered some eggs too. Doesn’t it make such a difference? Will have to add some speckles to mine! These look beautiful! I love the speckled look. Thanks Niki! 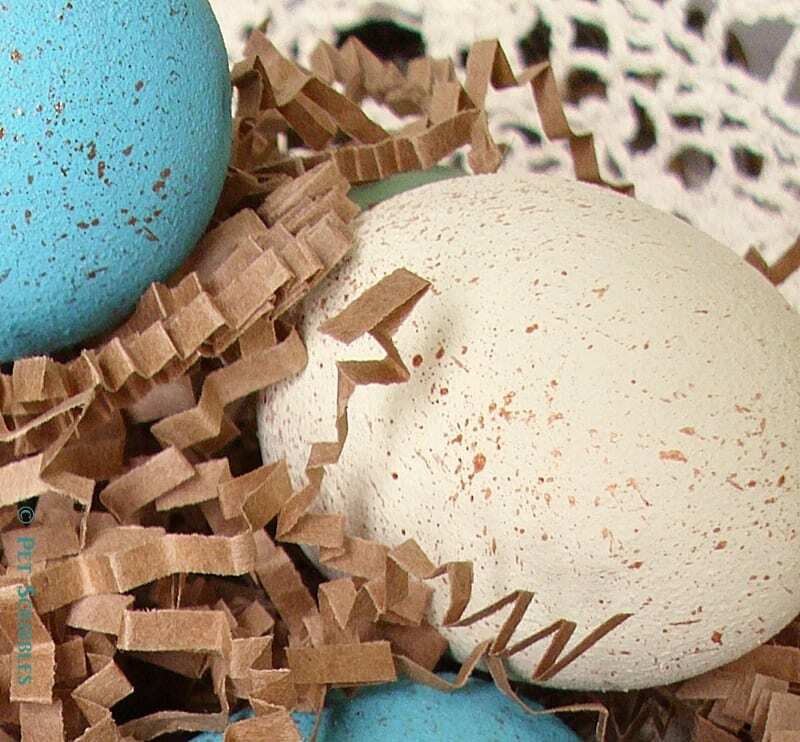 Now that I’ve seen this speckled look up close – and see how easy it is to achieve it – I’ll definitely make more of these eggs! I love the speckled look! They turned out gorgeous! Pinning!